The Blue Jays put a lot of stock in Jordan Groshans and his bat coming straight out of high school. The 12th overall pick in the 2018 First-Year Player Draft has proven thus far that he's up to the task. Groshans belted a homer and a double, finishing 3-for-4 with six RBIs and one run scored as the Rookie-level Gulf Coast League Blue Jays beat the Tigers East, 11-5, at Tigertown on Tuesday. The Blue Jays No. 8 prospect has 10 RBIs while going 8-for-14 at the plate in his last three games. The 18-year-old shortstop propelled his squad's early offensive charge. After a walk in the first inning, the third baseman lined a single to center field, plating Addison Barger to cap a four-run frame. In the third, Groshans poked a double to center, knocking in Steward Berroa and Adrian Ramos. After striking out in the sixth, the Magnolia High School (Texas) prospect belted his fourth homer of the season in the eighth, a three-run shot to left-center that scored Ramos and Barger. Groshans has amassed a slash line of .380/.439/.593 28 games into his professional baseball career. 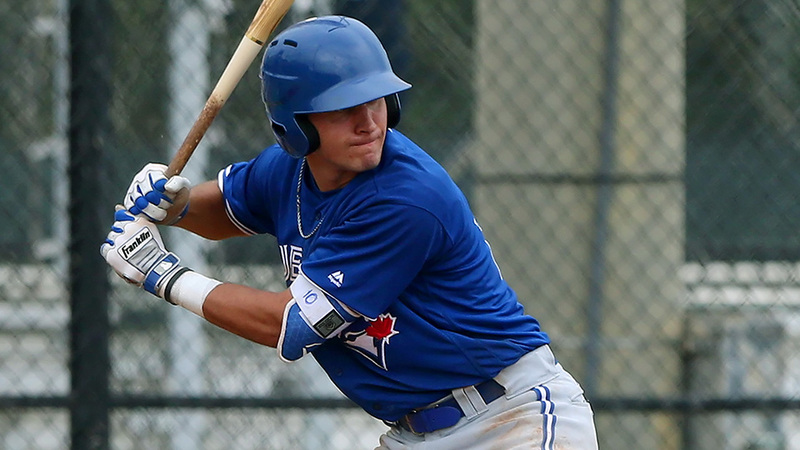 Yhordegny Kelly finished 3-for-5 at the plate with three runs scored and a solo homer for the Blue Jays. Ramos added a double, a single, two runs and two RBIs. Franniel Polanco (1-0) earned his first GCL win in relief. He didn't allow a hit or a walk while striking out two in two frames.